That’s according to Benjamin Henry Latrobe, in his diary in 1806. Every homeless person I saw when I visited Washington, D.C. this month reminded me of Pierre L’Enfant, who was himself homeless for a time on the streets of the city whose layout he designed. 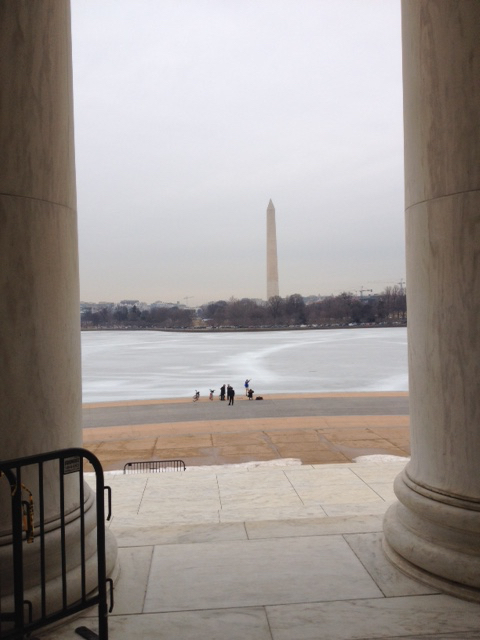 I love D.C., and took a break from New York to get some air there during its slushy-sandy thaw. D.C. is a city with a keen understanding of itself. Visiting there is like being in a geographic enigma, sprawling and aristocratic. Its subway platforms are mod, but dark and atmospheric, as if a nightclub opened at Charles de Gaulle Airport. The walk from the Capitol to the Lincoln Memorial, a true national treasure, is about as long as Central Park. While Central Park makes you feel like a fish in a rich person’s fishbowl, The National Mall is completely open to the sky and horizon. It gives you the impression you own a share of a vast estate. The Washington Monument, from inside the Jefferson Memorial. If Steampunk is a fantasy of a Victorian vision of the future, then the United States is Horsepunk, an Enlightenment vision of the future. The National Park Service reinforces this at the National Mall by keeping the path you walk on a sandy-gravelly mix, which gives you the tactile feeling, and ambient sounds, of walking through the 18th Century. Dominating all of it is the Washington Monument, which gives a bizarre, Egyptian flare to the otherwise Roman look of the republic’s holy grounds. By law it is the tallest building in the city, by far, and it’s so simple and elemental you can’t help but feel that the binding spirit of us as a people is an abstract principle. If you put a 500-foot replica of Brancusi’s Bird in Space halfway between Grand Central Station and City Hall, and then knocked out every building on the East Side of Manhattan below 50th Street, you could maybe achieve this kind of grandeur. My favorite, though, is a place I managed to revisit one morning this month after over 20 years, the Jefferson Memorial, that dome across the tidal basin from the Washington Monument. Jefferson speaks to that part of the American heart that just wants to go to a farm and read books all summer. Never mind war and business, and the messy work of getting stuff done. Let’s dwell in ideals. Jefferson strikes me as the smartest guy in the dorm room, the kid who already read all the books you’re struggling with, back when he was in high school. Who had an easy time with the women and already tried every drug, and whose political sensibilities could never be satisfied. Whatever you believed in, it wasn’t good enough. And his father, you find out during sophomore year, is the vice president of a nuclear bomb manufacturer. He is both wilder and more priveledged than you’ll ever be. Great idea putting this across the water from the others, since it celebrates an impulse that requires going away and thinking. How nice it would be to have a Roman temple built in one’s honor, with a few of your prose’s greatest hits up on the walls around your statue. 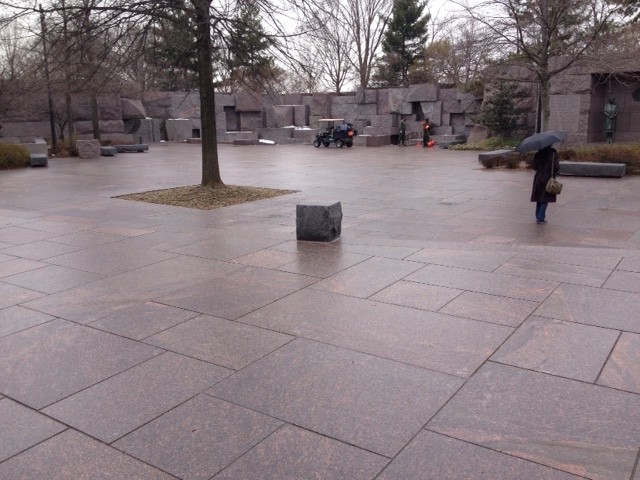 I was so inspired, I thought I’d take the long way back around the tidal basin. That’s where some cheeky Virginians tucked a hidden monument behind the hidden monument! George Mason, whom both Washington and Jefferson apparently regarded as a mentor, gets a lovely fountain – empty for the season, all the lovelier – with a strange little statue behind it, and bits of his prose that all seem to protest too much. We get it! “Life, liberty and the pursuit of happiness” was a rip-off of Mason. He is the Chuck Berry to Jefferson’s John Lennon, the founding father’s founding father. Next, since the last time I’d visited, F.D.R. and M.L.K. have gotten memorials, both completely dreadful. They’re sterile civic fitness trails meant to uplift the visitor who walks through them in an experiential manner, reading globs of text, without which they’d look like unfinished courtyards of corporate headquarters. I’m a liberal, and I can’t stand them. I can only imagine what conservatives think. They’re an embarrassment to liberalism, and should be dismantled. Start over. A good memorial is like a good film or screenplay. It works without the dialogue. If a monument can’t be appreciated on purely aesthetic grounds, no uplifting words can save it. And while we’re talking about excessive text or narration, let’s give museums back to the Muses. I wonder sometimes, when exactly did the unwritten rule of museum curatorship go into effect that says an any art exhibit must be 100% real artifacts, but an exhibit at an equally prestigious history museum is allowed to be mostly text written by the curators, with maybe some video and just enough artifacts to justify going to a museum instead of a website or coffee table book? I lasted five minutes in the Smithsonian’s National Museum of American History. Longer in the National Museum of the American Indian, mostly because it has a mind-blowing exhibit right now called Nation To Nation, a history of the major treaties between the United States and the various sovereign native nations. I bet that curators are under pressure to come up with exhibits about social history, and the till-now undervalued stories of history, but if you insist on providing all of the interpretation all the time, then you’ve curated the life out of a subject. If you can’t find any muskets or moccasins, you might as well post an essay on the website. The Victorians used to jam their museums full of stuff, and it probably frustrated lots of visitors, who just saw something like a glass case full of arrowheads, many of them broken, and nothing to interpret them with. Numbing as that may sound, when you walk into an exhibit about the Dakota-U.S. war of 1862, at the national museum, and all you see are panels with text on them, then it’s time to restore some balance toward the museum’s other mission, to give us a chance to contemplate the artifacts for their own sake. I learned something about history at the history museum, but I dreamed about history at the National Gallery of Art, where you’re left alone with a fragment of a Renaissance fresco or a Colonial soup terrine with cupids on it. 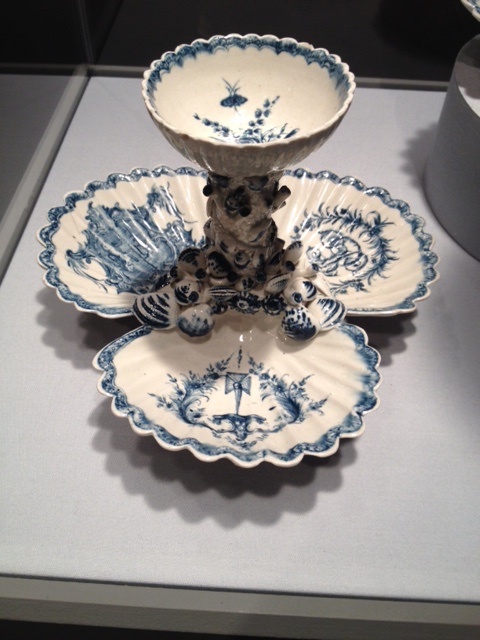 A scalloped 18th-Century pickle dish from Colonial Philadelphia, at the National Gallery. “Oh no, that’s a separate admission,” the uniformed attendant told me. An old Yankee town with competing historical societies! Now I was curious! “Thank you very much, ma’am,” I said, and went straight to the Memorial Hall Museum. I guessed right. It’s what a museum should be. It’s full of 19th-Century plows and old shoes and every reasonably intact butter churn they could find in their basement. “No ideas but in things,” William Carlos Williams famously said, and that applies to monuments and museums. What good are they if you can’t sit and muse with them?